When Theresa May pulled the "meaningful vote" on Brexit last month, the day before MPs were about to pass their verdict on her deal, Downing Street hoped two things would happen. First, that the EU would offer some form of legal guarantee that the Northern Irish backstop - the arrangements for avoiding a hard border on the island of Ireland - would be temporary. This, in turn, would bring the DUP on board - and unlock further support from previously hostile Conservative backbenchers. Second, that some sceptical MPs, once away from the febrile atmosphere at Westminster, would quietly reflect over Christmas that the deal wasn't as bad as all that, as it at least guarantees that the UK will leave the EU at the end of March. So perhaps any rebellion would diminish, if not evaporate. But neither hope has - yet - been realised, with the vote now less than two weeks away. So as things stand, the prime minister is once again facing defeat. But her difficulties could run even deeper than assumed. It was undoubtedly disappointing for Downing Street that the DUP's Westminster leader Nigel Dodds declared that the Withdrawal Agreement "flies in the face" of the government's commitments on Northern Ireland following his meetings with Theresa May and the Conservative chief whip Julian Smith this week. The government quite simply couldn't tell him that that the EU, at this stage, was willing to go any further than offering "reassurances" and "clarifications" on the temporary nature of the backstop, rather than legal guarantees. But even if the EU does move significantly in the next ten days, the prime minister could still be facing defeat. What the DUP's Brexit spokesman Sammy Wilson said on BBC Radio 4's Today programme on Friday was significant. He said he was "alarmed" that the Northern Irish backstop could become the "settled arrangement" on Brexit. Let's unpick this for a moment - because it goes to the core of Theresa May's difficulties. The DUP want to make sure the backstop is temporary and that the UK, including Northern Ireland, can exit from it without EU approval. If the EU can guarantee this, it's possible the DUP's MPs may grit their teeth and back - or abstain on - the deal, as would some long-standing Leave campaigners on the Conservative benches. But, as I understand it, up to 40 Conservative MPs still wouldn't back the deal because they, like Sammy Wilson, are worried about what the "settled arrangement" on Brexit might look like. They believe that the way the government will avoid a hard border in Ireland - and avoid triggering the backstop - is by agreeing a permanent trade deal that actually looks a lot like the backstop in any case. That is, the whole of the UK, not just Northern Ireland, would mirror some EU regulations on goods and stay close to the EU's customs arrangements. This would, they fear, then constrain the UK's ability to do future trade deals with the rest of the world. "The economic partnership should ensure….ambitious customs arrangements that.. build and improve on the single customs territory provided for in the Withdrawal Agreement." Downing Street officials have pointed out - until they are almost blue in the face - that the political declaration also specifically mentions an "independent trade policy" for the UK. But this doesn't appear to have neutralised some backbench concerns. 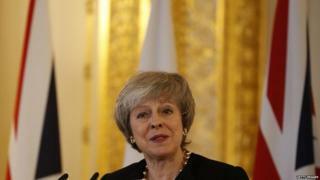 The prime minister will launch a "charm offensive" with Conservative MPs next week to try to allay any suspicions - though whether they will be charmed or offended is still an open question. Such is the lack of trust amongst a small but potentially crucial contingent of her MPs, I am told that in order for them to vote for her deal, she would need to convince them that she wouldn't handle the future trade negotiations after Brexit. And/or give them a firm date for her departure from office. Downing Street - and more widely, the government's - tactic is to raise the possibility of No Brexit unless long-standing Leave campaigners hold their noses and vote for her deal. This process has already begun. But expect it to be ramped up next week. The PM's allies will argue that unless the deal is settled soon, then opponents of Brexit and supporters of a new referendum will try to amend forthcoming non-Brexit legislation to make it contingent on a public vote taking place. And MPs who don't want a referendum but do want Theresa May's deal fundamentally renegotiated will be told that would mean extending Article 50 and therefore, in No 10's eyes, breaking faith with leave-supporting voters. So far these arguments don't seem to have worked. Some of her MPs will doubtlessly be poring over a YouGov survey published today. This was commissioned by London's Queen Mary University and Sussex University as part of a wider project into party members' attitudes and views. It suggested more than half of Conservative members - 53% - believe Mrs May's deal doesn't respect the result of the referendum. And 59% of them oppose her deal, while 38% support it. No 10 would argue that there is private polling which suggests her deal is more popular with the wider public. The You Gov survey itself suggests that 46% of likely Conservative voters (as opposed to members) back the deal, with a smaller number - 38% -opposing. There is another potential fly in the ointment for the prime minister - although here, adversity could be turned to advantage. It is assumed that the Lords will insert an amendment in to legislation on trade which would require the prime minister to negotiate a customs union with the EU. The government, in the normal run of things, would then vote this change down when the legislation returns to the Commons. But with Labour formally backing a customs union - and some Conservative MPs who backed Remain in the referendum also very warm to the idea - government sources are concerned that the Commons might not overturn it. So the argument that is likely to be made by government whips to the Brexiteer opponents of Theresa May's deal is this: Unless they grab the prime minister's deal before the trade legislation comes to the Commons, they might be landed with a customs union. And this wouldn't just constrain, but prevent, future independent trade deals. But the most likely option for at least reducing the size of any defeat on the deal is further movement from Brussels. The prime minister is talking the EU Commission President Jean Claude Juncker later and I am told she will be talking to other EU 27 leaders over the next ten days. There is a feeling in Whitehall that it may take more than one attempt to get the deal through parliament. One government insider likened the prime minister's situation to a game of American football. Things can look chaotic at any given moment but as long as you don't give the ball away to your opponents you can move incrementally towards your goal. But she has already had to make one backward pass - delaying the vote on her deal - and may need some trick play to get her deal over the line. As MPs return to parliament next week, the prospect of a prime ministerial victory appears some way off.